Medid has participated at the Cologne Hardware Fair with an unparalleled success. 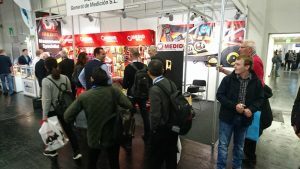 As in previous editions, MEDID has exhibited its products at the most prestigious trade show worldwide, the EISENWARENMESSE in Cologne. This year, the new location of the stand and the interesting novelties have made possible a constant flow of visitors that exceeded all forecasts. Our numerous European customers and the new contacts from all over the world could appreciate our wide range of high quality linear measuring instruments, that cover all the requirements of the most demanding professionals, that our customers really appreciate. MEDID is expanding his business in the German market, consolidating its commercial network in the north of the country.